Although Jon's book is not set to be released until November 2009 if you happen to find that charming man around IFP's Independent FIlm Week in NYC -- and you have some money in your hand -- you might just be able to get your paws on an advanced copy! Covering everything from theatrical, non-theatrical, semi-theatrical, alternative theatrical, grassroots/community, publicity, live events, to DVD, fulfillment, affiliates, print ads, educational, t-shirts, boxed sets, web marketing, sponsorships, to VOD, download to own, download to rent, streaming, to Web 2.0, Twitter, YouTube, iTunes, Hulu, Babelgum, Amazon, blogging, tagging, webisodes, to crowdfunding, crowdsourcing, transmedia, release winows, audience identification and targeting, – the book is your guide on how to use all the new tools available to you, and I know, because I wrote the forward. If you don't know Jon, check out B-side's interview with him, but whatever kind of content you create – feature film, short, webisodes, transmedia, You Tube – this book will be invaluable. The independent film community is a buzz with the collapse of the traditional independent film distribution model. No longer can filmmakers expect their films to be acquired and released nationally. But just as the digital revolution created a democratization of the means of production, a new hybrid model of distribution has created a way for independent filmmakers to take control of the means of distribution. This hybrid approach is not just DIY or Web based it combines the best techniques from each distribution arena, old and new. 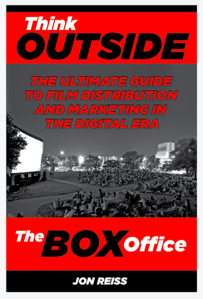 Pioneering filmmaker and author Jon Reiss spoke with countless filmmakers, distributors, publicists, web programmers, festival programmers and marketing experts to create this ultimate guide to film distribution and marketing for the digital era. Open this book! Eat up every morsel Reiss provides. Internalize it and make it your second skin. It is not a question of “just doing it”: we need to educate each other, tend to one another’s children, and inoculate our villages against the viruses of despair and isolation. Reiss translates the formula for world peace to apply to Truly Indie Film Distribution and beyond! Book Signing 2:15 - 2:45 pm and 5-6pm in the Lobby of the Vancouver International Film Centre, 1181 Seymour Street That day, Jon will be on the panel: 21st Century Doc Distribution Strategies 1:00 - 2:15pm.